As a young lawyer, Judge Gutierrez practiced in southwest Idaho. In November of 1993, Governor Cecil D. Andrus appointed him as a district judge. He was then twice elected to retain this position by the voters and also served as Administrative District Judge. Governor Dirk Kempthorne appointed Judge Gutierrez to serve on the Idaho Court of Appeals beginning in January 2002, and he subsequently has been elected to serve two full terms. 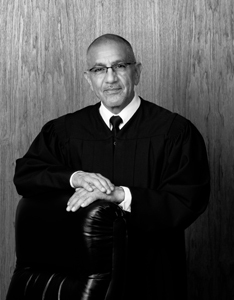 Beyond the bench, Judge Gutierrez’s involvement in the judiciary includes serving as chair of the Idaho Supreme Court Fairness and Equality Committee and co-chair of the Judicial Recruitment Committee. He has previously served as a member of several other Supreme Court committees, including those dedicated to Civil, Jury, Drug Court and Discovery Rules. Judge Gutierrez has also been a member of the Governor’s Coordinating Council for Children and Families and the Governor’s Criminal Justice Commission, and he currently serves on the Governor’s Lincoln Bicentennial Commission. Judge Gutierrez is also active in the community. He enjoys taking time to visit schools and other youth organizations to inspire students to pursue their education.